For the first time bottled King Coconut (thambili) water from Sri Lanka is now available at London’s fashionable department store Harrods. It was launched at Harrods last week by Founder/Director of Jeeva Natural UK Ltd, Bhavi Kanadia and Sri Lanka’s acting High Commissioner Sugeeshwara Gunaratna. Though packeted and bottled Coconut water from Thailand and Philippines in particular is available in supermarkets and grocery stores in the UK, Sri Lanka’s King Coconut water has not been on sale here in bottled form, though Sri Lanka stores sell the thambili nut. Ms Kanadia told the Sunday Times that, though thambili is initially available at Harrods, it will be sold at other upmarket stores in London and other outlets such as pharmacies where health foods are on sale. She said that her company Jeeva, inspired by a Hindi word meaning “full of life”, promotes natural health foods, and uses the slogan “come discover a golden heritage” to market the Sri Lankan drink. Ms Kanadia said that, while the pure thambili water is available in bottled form, her company has also launched flavoured thambili such as mint and lime; matcha tea (a Japanese green tea); ginger and lemon grass to enhance the healthy goodness of thambili water. 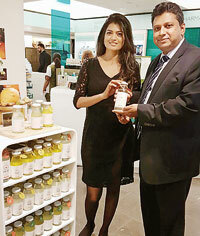 The bottled thambili is supplied by Tropical Green, a subsidiary of Explolanka, with which Bhavi Kanadia had discussions and gained firsthand experience during a 10-day visit to Sri Lanka in May. She said the initial attempts to bottle thambili water shipped frozen in barrels, in London, was not of the quality she desired. Hence, the whole process is now done in Sri Lanka. Today a 200 ml bottle of thambili sells for £4 at Harrods.